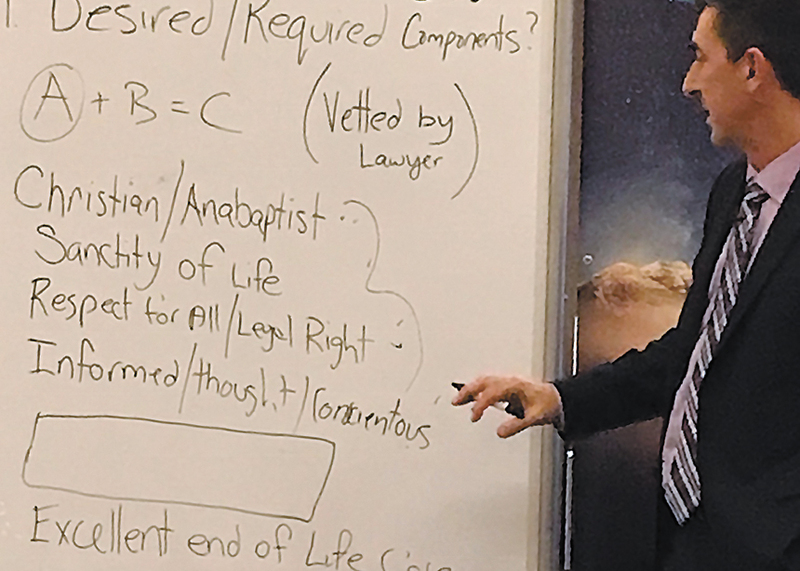 When members of the Canadian Mennonite Health Assembly gathered at Menno Place in Abbotsford in early November 2018 to discuss this year’s theme, “Living our values,” medical assistance in dying (MAiD) was on the agenda. This preliminary statement will be followed by legal consultation that will result in a final statement on the issue at a later date. The Health Assembly is a group of 28 healthcare providers from Ontario to British Columbia that were founded through Mennonite people. Member organizations include Communitas Supportive Care Society and Menno Place in B.C., the Edmonton Mennonite Centre for Newcomers in Alberta, Mennonite Homes of Saskatchewan Inc., Eden Health Care and Winnipeg Mennonite Seniors Care Inc. in Manitoba, and the St. Clair O’Connor Community and Parkwood Mennonite Home in Ontario. The members’ goal is to serve the healthcare needs of individuals, particularly the frail and vulnerable, as faith-based providers, with many retaining Mennonite leadership through their boards and executive staff. Their values include spirituality and prayer, human dignity and compassion for all people, stewardship, justice, peace and reconciliation, and ethical rigor. In the assembly’s opening session, lawyer Kevin Boonstra summarized the changing climate of religious freedom in Canada. Boonstra had represented Trinity Western University of Langley, B.C., in its case with the Supreme Court of Canada regarding establishment of a law school, a case that the university ultimately lost. The weekend concluded with a communion service led by the spiritual care coordinators at Menno Place.